Named for a ranch on the Pt Reyes National Seashore, our summer seasonal cheese, Pierce Pt, starts with organic Jersey milk from John Taverna's Chileno Valley Dairy. These rich, bloomy rind wheels are dusted with a beautiful mixture of field flowers, chamomile, calendula and Thai Basil. Pierce Pt is herbal and savory, and its paste offers a tangy brightness. Made from a blend of cow and goat milks, Seascape is a cheddar-style cheese with a semi-firm, smooth texture. The goat's milk lends it a pleasant tanginess, while the cow's milk offers undertones of butter and caramel. This cheese has a natural brushed rind and has been aged for a minimum of 4 months. 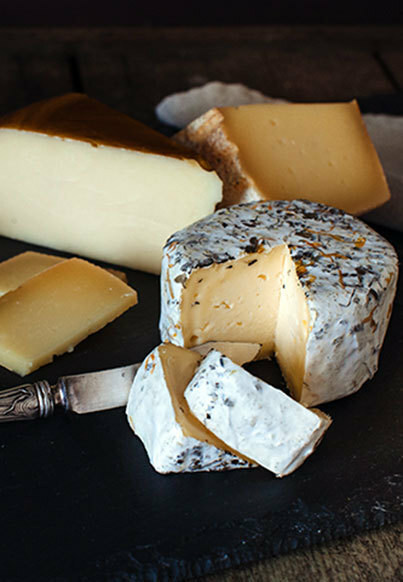 “We like a cheese with curves” says Seana Doughty who in 2008 quit her desk job and immersed herself in the world of cheese. She soon opened her own creamery, Bleating Heart, and began making sheep's milk cheese in the cooler climate of the Northern California coast. Each wheel of “Fat Bottom Girl” cheese is totally hand crafted with the raw milk from dairy sheep that live and graze freely on open pastures. Made in small batches, Fat Bottom Girl is appealing to cheese geeks and novices alike. Its orangish rind is achieved by careful hand rubbing with a salt water solution during the 3 to 4 month aging period.